I recognized 5 things that African children do, then combined them into a solar powered television that places Sesame Street along with Info-Commericals. There are millions of books you can read for free. So, how do we get the children off the TV, off the Internet, off Facebook, and off YouTube.com, and reading books? Maybe they need books that are fun to read! I believe a good teacher would help install an e-book reader on every phone held by a student, and make sure there were the 100 classics loaded into memory. Now, did you know, 1 in 7 people on the planet do not have electricity, about 1.4 billion people on the planet? Now, did you know, there are 7000 languages on the planet? I am Andy Lee Graham, from Orland, Indiana in the USA, and I have lived abroad for over 18 years, and in 107 countries. It has come to my attention over the years, that aid organizations can have some good ideas. How Many NGO”S on Planet? That is a lot of NGO’s, and a lot of good ideas. How to spread a good idea around, like reading books on smart phone, to people with no electricity, and speaking some local dialect, some local language that few people on the planet speak. 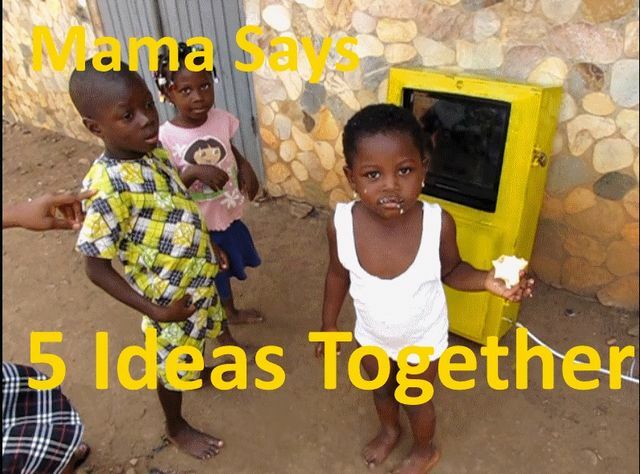 Well, this is what Mama Says does; it communicates good ideas to locals in their language. How to market a good idea to locals who speak weird languages, with no electricity? An innovation takes a few normal ideas, and combines them in a novel way, and creates a synergy, a more effective way of getting the job done. Of course, it is the dream that teachers would be doing this, but, we know, making it profitable for the Internet cafes may work faster. Normally, what happens, an aid organization drives up in a big Toyota Land Rover, talks to a few people from the village, the chief, the business people, and says hello. The hopes, often delusion ally believes this information is passed around, and why not? Great ideas are shared? No, they need more. Pretend a Chinese person drove up in the same Toyota, Land Rover in Ohio, New York, or California, and started speaking Chinese. This is essentially what happens in Africa. The Aid organizations speak the dominate business language of the country, and the locals speak what they speak, what a disconnect. How to bridge this gap in communication, this is the job of Mama Says? Innovation is bringing together verified ideas in a novel way to more effectively accomplish a goal. 1. Children are attracted to televisions. (The television shows, videos attract the children to Mama Says." 3. Children think in their own indigenous language, understand, learn, and comprehend in their own language. To learn in second language, a foreign language is more difficult than learning in their native language, the language spoken at home with parents. 4. Repetition is effective learning, sort of like hearing the same commercial on TV until it drives us crazy, we do not forget. 5. Children singing information commercials are interesting. While talking, or shows used shown like teachers, are boring. Higher education helps employment, knowledge allows people to make enough money to live comfortably. The only requirement for knowledge is books. Aid will only end, when everyone on the planet has the knowledge of the world free, and they know how to access it.